Richard Molesworth tells the story of that busy weekend, from his article first published in DWB issue 122, in January 1994. 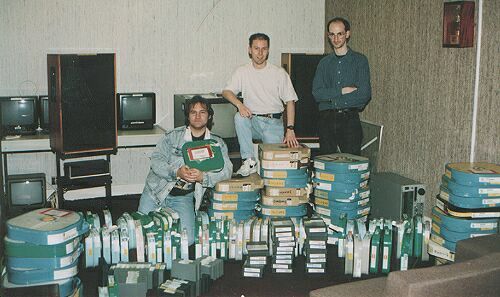 ABOVE: Team members Richard Molesworth, Steve Roberts and Paul Vanezis in the Viewing Room at Pebble Mill, surrounded by approximately one-tenth of the BBC's Doctor Who master tapes. The large blue and brown boxes stacked in piles contain two-inch Quad tapes, the light blue and green boxes standing vertically contain one-inch C-format tapes and the smaller rectangular boxes are a mixture of Betacam SP and D3 cassettes. One quad tape of an episode of 'The Talons of Weng-Chiang' was still labelled under its original production title, 'The Talons of Greel'! SITTING in a BBC Edit suite watching endless clips of DOCTOR WHO is not as exciting a way of passing a few hours as you might think. To my right, Steve Roberts is trying to repair a faulty Wave Form Monitor on the one-inch machine he is operating whilst to my left, Paul Vanezis is watching a monitor showing a clip from The Face of Evil episode one. Tom Baker threatens a frightened-looking Sevateem with a deadly Jelly Baby, and Paul tuts to himself as playback problems on the two-inch machine he is operating causes white flashes to appear on the picture, whilst the thundering sound of a fist impacting on a metal casing tells me that Steve is rapidly losing patience with his faulty monitor. I finish annotating the list that I'm compiling as we go along, of which clips we've transferred onto which tape, and take another armload of one-inch tapes back into the VT Press Area which is doubling up as our temporary-storeroom. I put the tapes to the side of the room that contains the material we have already transferred, and gaze over to the huge pile still waiting to be used. It is late on a Friday afternoon, and all that is keeping me going is the thought of the Chicken Tikka Balti that awaits at the Shapla Tandoori later that same evening. My involvement with the documentary Thirty Years in the TARDIS came about after LATE SHOW Director, Kevin Davies, decided that it would be more economical to have the video transfers (of all the clips he wanted to use in the programme) done at BBC Pebble Mill. Under "Producer Choice", any BBC Programme or Production Department can resource any part of the production process from within or from outside the BBC, irrespective of where the programme is based. This was fortunate, as an employee of BBC Pebble Mill in Birmingham, Paul Vanezis, was a keen follower of DOCTOR WHO-his involvement 'behind the scenes' has proven invaluable, not only by ensuring that material is returned to and kept by the BBC, but also by playing a key role in the A/V production of the majority of the UK's leading conventions, such as Nebula, Manopticon and Panopticon. I've known Paul for well over ten years and have collaborated with him on many projects, including the title sequences for the last four Panopticons. Paul contacted Kevin, and it was agreed that BBC Pebble Mill would he responsible for transferring all material from videotape for use in the documentary. Paul's empathy with the subject matter was a key factor in this decision, as were the competitive rates offered by Pebble Mill. Assisting Paul with the task of video transfers was Steve Roberts, himself an integral part of the LATE SHOW team. Paul and myself have known Steve for a couple of years, and were indebted to him for his sterling behind-the-scenes work as part of the Audio Visual team at this year's Panopticon . Steve, as I'm sure many readers will know, was a member of the team responsible for the 'recolourisation' of many of the early Pertwee episodes, and was also one of the driving forces behind Resistance is Useless. My original involvement with the project was just that of casual interest, until Paul contacted me with a list of clips that Kevin had asked for. He visited me on Saturday 23rd October, and gave me a copy of the details that he had been sent. Kevin had given him a list that included at least one clip from nearly every single story. The extracts had been selected by a number of people, including Ian Levine and Andrew Pixley, and the list had then been annotated by Andrew to give an indication of which episode the clip came from, and a timing of how far into the episode the sequence was. Paul had booked a VT suite, (which was a multi-format area, with equipment capable of playing back two-inch, one-inch, Betacam and D3 tapes) in Pebble Mill for Friday 29th and Saturday 30th October to do the video transfers, and was presented with two rather acute problems . Firstly, the list of clips was not nearly specific enough (at one point, it was asking for a clip from a story called "Malus". It's easy for fans to be able to spot the mistake, but such information confused the Acquisitions Librarians, and so had to be corrected). One or two clips were also judged to come from the wrong episode, and this had to be sorted out as a matter of urgency, to prevent incorrect episodes being ordered from London. More importantly, the actual timings of the clips (ie: how far into the episodes) were also completely wrong, some being more than 10 minutes out. It was essential that these timings were completely accurate if the transfer sessions were to go ahead as planned. So, armed with the many BBC video releases, copies of UK Gold transmissions, VHS tape supplied by the BBC, and my own collection of fuzzy tenth generation episodes, I spent upwards of ten hours over the next few days going through old episodes of DOCTOR WHO providing accurate timings for all the clips that the LATE SHOW team had asked for. This was, however, limited to material that we would be transferring from videotape and so I restricted myself to clips taken from Doctor Who and the Silurians onwards. After consultations with Paul and Steve, it was decided to also produce a list of alternative clips that might be used in the programme, as it was thought that many clips were not suitable for inclusion as "stand alone' inserts-out of context with the rest of the episode/story, they just did not work. I then went away and drew up a list of another 100-or-so clips, using wherever possible episodes that the LATE SHOW team had already suggested. However, it was still not clear at this stage if the extracts that the LATE SHOW team had asked for were just loose suggestions, or whether they were specifically important for prepared inserts into the documentary. To this end, we had to ensure that every clip that they had asked for was transferred, plus all the clips that I had also suggested. On the following day (24th October), Paul transferred the 90-minute studio recording spool for Death to the Daleks. This was on two-inch 625-line videotape and the picture quality was perfect, although there were a few minor problems when Paul first played the tape. I had been invited along to watch the transfer, and was intrigued to see how many BBC personnel "just happened' to wander into the VT suite to watch a piece of vintage DOCTOR WHO material. The material was to be used in the documentary to illustrate an interview with Elisabeth Sladen and was transferred onto a Betacam SP cassette, which was the format the documentary was to be edited on. Also transferred on that Sunday were clips from City of Death, The Armageddon Factor, Inferno and The Claws of Axes. By this time I had started getting timings for certain clips (luckily, I had already worked out the timings for the above stories), and Paul had started ordering up material from London. This was to become the second major problem. The difficulty was that the material, over 120 tapes, had to be sent to Birmingham from Windmill Road in London. This wasn't a problem in itself, as there was a daily delivery van that made the journey from London to Birmingham that could transport the tapes. However the way DOCTOR WHO is kept by the archives is very complicated. The vast majority of William Hartnell and Patrick Troughton episodes are kept on either 16mm or 35mm black and white film. Some episodes do exist on video tape, due to repeats (The Time Meddler and the Pilot Episode, for example), but in the main, the transfer of material from these episodes was not our responsibility; neither was material from Spearhead from Space as that is kept on 16mm colour film. But from Doctor Who & the Silurians onwards, the BBC keep all the colour material on some format of videotape. Every episode from Doctor Who and the Silurians through to The Fire Doctors was originally-recorded on 625-line two-inch colour videotape. Where the original colour recordings still exist, this is the format that they are kept on. However, as everyone knows, the BBC was rather careless with many of the Pertwee episodes... What remains is a collection of episodes on 625-line two-inch colour videotape, 625-line one-inch colour videotape, 525-line two-inch colour videotape, 525-line one-inch colour videotape, 625-line tapes converted from 525-line, 625-line D3 videotapes, recolourised D3 tapes, Betacam SP 625-line tapes, and 16mm film. There were only a couple of clips needed from the few remaining black and white Pertwee episodes, and as they were only kept on film we weren't able to transfer clips from these episodes. From a logistical point of view, it was decided that D3 and Betacam SP formats of episodes would be ordered, in PAL whenever possible. Failing this, one-inch would be used, and failing this, we would go for the original two-inch material. This was to present problems in itself, as two-inch tapes are very big, heavy and cumbersome (about the size of a car wheel), and there was only a limited amount of space in the van that would bring them up from London. The same problems occurred with the Tom Baker and early Peter Davison episodes, which in the main only exist in PAL two-inch formats, and was as much of a problem. By the time we began the transfers, we had 57 two-inch tapes at Pebble Mill. From Warriors of the Deep onwards, all episodes were kept on one-inch 625-line tapes. Although bigger than D3 or Betacam SP, they were not as cumbersome as two-inch tapes, and so we were able to order every episode that we needed from this point in the programme's history. BBC Pebble Mill already held the one-inch tapes for The Awakening, as Paul was attempting to repair them (the tape for part 1 is quite badly damaged). Paul began ordering the material in batches over the week before the booking was due to start, with the material arriving from London the next day. He and I went through the list of tapes needed and 'prioritised' them, as we could only order up to a dozen tapes at a time. Steve Roberts travelled up to Birmingham on the Friday, and the three of us arrived at Pebble Mill quite early, and started to examine the material that had already arrived. Checking through all the original two-inch tapes that had been transferred to Pebble Mill was extremely fascinating. For example, episodes five and six of The Talons of Weng-Chiang were labelled as The Talons of Greel, with the final word crossed out and Weng-Chiang hurriedly written on instead. Pyramids of Mars episode two was labelled as The Martian Pyramid, whilst the two-inch tape for Frontier in Space episode six was covered in labels from TV stations all over the world, including ABC in Australia, who had returned it in the early eighties. Not all of the material that we had requested had been delivered, for a variety of reasons; for example, other programmes were doing features on DOCTOR WHO and had ordered the episodes for their own use. Episodes from such stories as Arc of Infinity, The Androids of Tara, The Invisible Enemy and The Visitation didn't arrive, although the documentary makers would have the opportunity to take any clips they needed from these episodes at a later date. Other episodes released to us-episodes five and six of The Green Death for example - had to be sent straight back to Windmill Road without us having the chance to take clips from them because they were booked in to be remastered onto D3, and it was too late to cancel the bookings. The work of transferring the clips began. Paul was working on all the material on two-inch videotape, whilst Steve worked with all the one-inch, Betacam SP, and D3 material. I co-ordinated them both, whilst keeping a running log of which clips were being copied onto D3 tapes. I had the easy job - I was sitting down. D3 is a digital form of 625-line videotape in cassette form. As it is digital, the picture quality is as good as the source material, and there is no generation loss or deterioration in the quality. D3 has recently superseded one-inch as the transmission standard for the BBC, but the number of D3 machines available is still quite limited and so the LATE. SHOW team had decided to edit the programme on Betacam SP, which is another form of videotape, again in cassette form. But this is not digital, so there is a small amount of generation loss each time material is copied, and pictures of broadcast quality cannot be achieved after more than four generations or so. Betacam SP machines are also more plentiful both inside and outside the BBC, and so editing time is much cheaper. Although we compiled the clips onto D3 tape, we then made two Betacam SP copies of each D3 tape, which would simplify the editing process (if a clip from one tape had to be followed by a clip from the same tape, for example; or if any form of mixing - as opposed to jump cuts - were to he used). Two-inch machines are incredibly huge and sensitive pieces of equipment, and it takes a great deal of technical skill to operate them competently. The tape can take upwards of fifteen minutes to line up correctly before it can be played. To line-up any sort of videotape, including two-inch, the beginning of the tape has to be played. On the start of the tape is a couple of minutes of colour bars, the signal from which is fed through a Wave Form Monitor and Vectorscope, which gives readings for each individual colour's signal. These signals have to be carefully aligned to pre-set standards in order for the tape to play back with proper colour outputs. (As a side note, I was astonished to find that Paul could identify the brand of two-inch tape he was playing, just by the smell it made when passed through the video heads of the machine). Once lined up, the machine has a real time counter that can read the amount of time the tape has been wound through. This counter is not electronic, being more akin to the number counters of early home VCRs, and was the only way of determining exactly where you were in the tape. Unfortunately, you can't 'picture search' through two-inch tapes, and so accurate timings were essential to be able to locate the clips needed. Because of the speed at which two-inch tape spools it is very easy for them to snap or be damaged if used incorrectly or if the tension is wrong, and so it was very important that the amount of time two-inch material was actually in use on the machine was kept to an absolute minimum, to ensure that episodes of DOCTOR WHO Were not damaged in any way. Fortunately, no mishap occurred, although a few of the tapes were in a very bad condition, and Paul had to monitor closely each episode on the machine as it was playing. One of the hardest episodes to line up and play correctly was The Deadly Assassin episode four, which took four or five attempts before it would play to Paul's satisfaction. This was because the colour bars at the start of the tape bore no relation to the colour signal of the actual episode, causing much frustration. Another tape that caused problems was The Face of Evil episode one, which had originally been recorded on a machine with incorrect technical settings, causing the two-inch machine to over-compensate for a fault that wasn't actually there. This caused white streaks to appear over the picture, and there was nothing we could do to correct this. Other episodes seemingly had the same fault, including The Invisible Enemy episode one and Horror of Fang Rock episode one. These episodes were later played and checked on another two-inch machine at Windmill Road and the problem didn't re-appear, so it seems that they will be alright when their turn comes to be remastered onto D3. In the meantime, Steve Roberts was transferring material from the one-inch tapes that we had, a task which was complicated by the afore-mentioned faulty wave form monitor on his machine which caused problems throughout the two day session. Because of the format, one-inch tapes are easier to line up than two-inch, and could be 'picture-searched' through to the desired tapes. Many of the one-inch tapes for the Colin Baker episodes were fascinating to watch, due to the ingenuity of whoever was responsible for adding the time clocks at the beginning of the episodes, most of which featured Colin's face superimposed over the clocks! A clip of Colin Baker on the exercise bike from episode nine of The Trial of a Time Lord was requested by the production team. The general consensus was that the music used for this scene was terrible, and so we ordered up both the transmitted episode and the longer, unsyphered 71 edit so we could transfer the clip without the music. Unfortunately, the 71 Edit didn't arrive in time for the transfer session, and so the clip was taken from the transmitted version... Steve was able to 'remove' the music from the soundtrack for the transfer of the clip as, luckily, the one-inch transmission tape still contained the unsyphered sound for the episode on track two. Hopefully this version will be used in the documentary. Fortunately, all of the 'recolourised' Pertwee episodes exist on D3, which Steve started to transfer after all the one-inch tapes had been done. These tapes were used for clips from Doctor Who and the Silurians, The Ambassadors of Death, Terror of the Autons and The Daemons. The recolourised episode six of The Time Monster was also on D3, from which a clip was taken. When it came to clips from The Sea Devils, we elected to use the D3's that had been used for the repeat transmission of that story in 1992 - also in the archives was a D3 tape of episode 5 in the PAL 625-line format, which was not transmitted for technical reasons (the 525-line NTSC conversion being the version shown). As this was only needed for a brief clip, we used the 625-line tape as our source material. Also transferred by us were odd clips from certain black & white episodes, such as The Faceless Ones episode three, the Pilot Episode and The Tomb of the Cybermen, all of which had either D3 or one-inch copies. We also had the D3 cassette of the recently located Dalek clips from The Daleks' Masterplan episode two, which was also copied onto the LATE- SHOW'S tapes. It is hoped that these tapes will he archived for future programme makers to have access to, which will alleviate the need for the constant ordering and playing of old episodes, which in turn will hopefully reduce the risk of episodes being damaged in the future. Once we had finished, Steve went back to London on the following Sunday, taking the edited Betacam SP tapes with him, and Paul began the huge task of sending the material back to the BBC Archives, who were actually quite desperate for some of the material, such as Warriors' Gate and The Horror of Fang Rock, as the tapes had to he passed rather urgently to BBC Enterprises so that UK Gold could have copies in time for their DOCTOR WHO weekend. The two days of hard work were soon completed, with all the clips that we needed, from all the episodes that were sent, finally transferred, This amounted to over 70% of the material that was targeted, with over 30% of these clips being ones that I had suggested using - how many will turn up in the finished programme I don't know. A staggering 6 hours plus of material was transferred to D3 and Betacam SP in what amounted to a 12-hour editing session stretched over two days, and I think it is fair to say that without the involvement of Paul, Steve and myself, the LATE SHOW team would have had to have spent far more time and money locating and transferring the clips for the documentary. If nothing else, our work will have enabled them to have a wider selection of material for use than might otherwise have been the case. I hope the end result is something that does the programme to which it is devoted - DOCTOR WHO - justice. My only regret is that we didn't get to transfer some of my personal favourite clips for the show, such as the brilliant TARDIS breaking down effect from The Horns of Nimon episode two, or the Doctor's scarf being cut in half from The Androids of Tara episode one, but I'm assured that the production team had ample opportunity to obtain all the material we were unable to transfer. One other clip that was never transferred was one that Steve, Paul and myself felt would be a great clip with which to close the programme - a monster striding towards camera, booming ''The programme must continue..." Bet you don't know where that clip comes from? But this was not the end of the story - due to editorial decisions very late in the day, the content of the documentary was under almost constant review, and I was put on standby to travel down to London for a couple of days, in case they needed someone with a good knowledge of the programme's history. However this eventuality never came about, and so my involvement with the programme was at an end - I can't wait to see the end result! PS - "The Programme must continue " was said by a Nimon three minutes and four seconds into episode three of The Horns of Nimon.